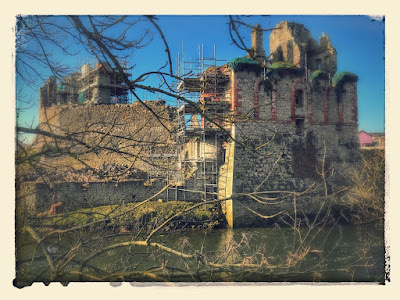 The ruins of Limerick Hellfire Club stand beside the ruins of the Desmond Castle on the island in the middle of the River Deel. As the fast-flowing waters of the river thunder past, making their way under the old narrow bridge, these ruins appear like a benign presence in the heart of the town, especially in the early evening as the sun sets behind them and the rooks and herons hover above the remains of this centuries-old crumbling structures. The ruins of the Hellfire Club stand within the bailey of Askeaton Castle. They date from 1636-1637, when this building was first erected as a detached barracks or tower. The barracks or tower was built by the builder and designer, Andrew Tucker, for Richard Boyle (1566-1643), the 1st Earl of Cork, who had recently acquired Askeaton Castle. The tower was built with battered walls with cut stone quoins, and the remains of a three-bay was built on top of the battered base later, some time in the mid-18th century. There is a bow to the south elevation of the house and a shallow projecting end-bay to the north elevation. The house is roofless, with a limestone eaves course. The course rubble limestone walls have tolled quoins, a brick stringcourse and brick quoins to the upper floors. There are square-headed door openings to the north elevation, a square-headed window opening to the bow with a brick architrave, and camber-headed window openings to the west, with brick voussoirs. The round-headed window opening to the east elevation has a brick surround, flanked by round-headed niches with brick surrounds and a continuous brick sill course. By 1740, the building belonged to the St Leger family, who may have engaged John Aheron to design the bow-sided house which was built on top of the base of the barracks. By then, this was the meeting place of the Askeaton Hell Fire Club, and the building was probably used by the club until the end of the 18th century. The club in Askeaton traced its origins to the first Hellfire Club, formed in 1719 by Philip Wharton (1698-1731), 1st Duke of Wharton. Wharton was a rake who gamble away Rathfarnham Castle in Dublin and most of his inheritance. In 1726, he married Maria Theresa O’Beirne (sometimes known as Maria Theresa Comerford). When he was in the advanced stages of alcoholism, the couple moved to a Cistercian abbey in Catalonia, where he died in 1731. His widow returned to London, and after his will was proved in court she lived comfortably in London society. The club continued long after Wharton’s death, and the club in Askeaton was founded around 1736-1740. Known as a satirical gentlemen’s club, the revelries of its members shocked their neighbours and the outside world. The two other clubs in Ireland were based on Montpelier Hill, south of Tallaght, and near Clonlara, Co Clare. In his recent book Blasphemers & Blackguards, The Irish Hellfire Clubs (2012), David Ryan examines the stories of these clubs. But, while local folklore recalls lurid tales of outrageous rituals, there is little actual information or evidence of the activities of the Askeaton Hellfire Club, and the name and supposedly lurid activities may have been opportunities to slight the church and to snub clerical authority, or mere excuses to hide their debauchery during evenings of wine, women and song. Evidence of the club and its members survives in a painting by James Worsdale (1692-1767) from sometime between 1736 and 1740. 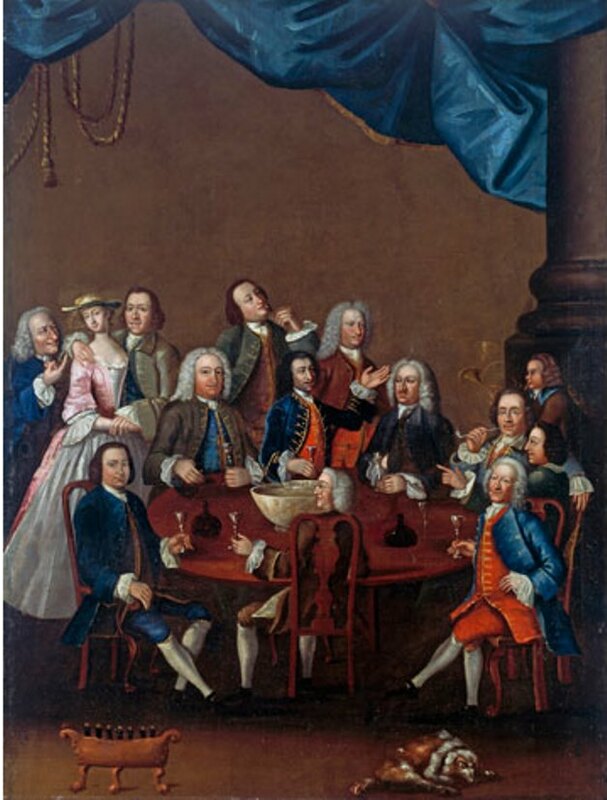 This painting shows a group of club members in Askeaton drinking, smoking and in conversation. Bottles of wine sit on a rack in the foreground, and there is a large bowl of punch on the table. Eleven men and one woman, as well as a boy, fill the painting. Some of the figures that have been identified include: Edward Croker of Ballingarde, his son John (died 1804); Wyndham Quin of Adare, father of the 1st Earl of Dunraven; Thomas Royce of Nantenan, near Askeaton; John Bayley of Debsborough, Nenagh, Co Tipperary; and Henry Prittie, father of Henry Prittie (1743-1801), father of Lord Dunalley. Worsdale, who was a founding member of the Dublin Hellfire Club, is on the far left of the painting, trying to attract the attention of the only woman in the painting. Most critics identify this woman as Margaret Blennerhassett, who was known as Celinda and who was the wife of Arthur Blennerhassett, a magistrate, of Riddlestown Park, Rathkeale. She was born Margaret Hayes, the eldest daughter of Jeremiah Hayes of Cahir Guillamore, Bruff. Celinda is said to have been the only woman who ever became a member of the Askeaton Hellfire Club. The story is told that in her curiosity she tried to find what the men did during their meetings at the club. She hid herself in the meeting room before the members arrived, and when they discovered her she was formally inducted as a member to ensure her silence. Later, her husband drowned in a boating tragedy in the Lakes of Killarney in 1775. Some critics, however, have identified the woman in this painting as Laetitia Pilkington, alongside her husband, the Revd Matthew Pilkington (1701-1774), one-time friends of Jonathan Swift, Dean of Saint Patrick’s Cathedral, Dublin. This would date the painting from some time before 1738. Matthew Pilkington moved to London, where he became friends with the painter James Worsley, led a dissolute life, divorced Laetitia, and was jailed in 1734. When he returned to Ireland, he enjoyed the patronage of Archbishop Michael Cobbe of Dublin and the Cobbe family of Newbridge House, Donabate. Laetitia Pilkington (1709-1750), was the daughter of a Dublin obstetrician, Dr John van Lewen. After Matthew fabricated the circumstances that led to their divorce, she was arrested for a debt of £2 and ended up in a debtors’ prison in London. ‘Our seducers were our accusers,’ she wrote. When Laetitia Pilkington died in 1750, a monument was erected in Saint Ann’s Church, Dawson Street, Dublin, with clear references to the sufferings she had endured at the hands of her merciless husband. Less than a month after her death, Matthew Pilkington married his mistress Nancy Sandes. In 1811, an evangelical magazine published an obituary of Captain Perry, a carousing individual and likely member of a Hellfire Club. After a short lifetime of excessive living and radical thinking, he died an early death as he struggled to repent. It was a warning to readers of the dangers of being involved in such circles. The building was abandoned by the club sometime around 1840, and the club is inaccessible to the public, as the Office of Public Works continues work at stabilising the building. The Limerick Leader in May 1958 that James Worsdale’s painting of the members of the Askeaton Hellfire Club was being offered for sale to Limerick City Council for £350. It is now in the National Gallery of Ireland. Although the ruins of the Askeaton Hellfire Club have fallen into disrepair, the overall original form of this building is easily discerned, as are features such as the door and window openings. It retains many well-crafted features such as the brick window surrounds and limestone battered walls, and the high roof and the tall chimneys are of interest. The building has a curved bow at one side of each of the building’s two principal fronts, and one of them has a Venetian window. If, as is possible, the house dates from the 17th century, then this could be one of the earliest known examples of a Venetian window on a curve, not just in Ireland but anywhere else in Europe – which could just make it a far more interesting building than the myths and legends surrounding its rakish revellers.